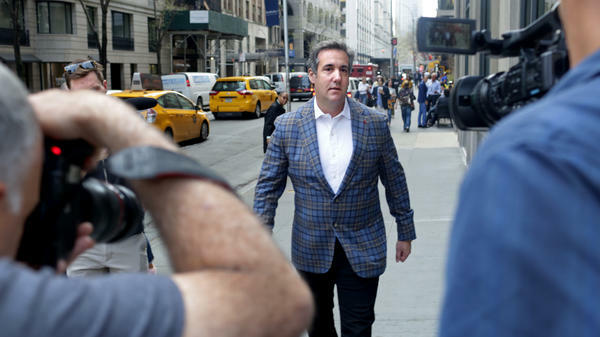 Michael Cohen, President Trump's personal attorney, will appear in court Monday afternoon, as his attorneys argue that he should get a first look at documents seized from him last week, to decide if they violate attorney-client privilege laws. Donald Trump's longtime attorney Michael Cohen is set to appear in federal court on Monday afternoon as he and the president are fighting to be able to review documents seized last week by federal agents before prosecutors do. The hearing will be Cohen's first appearance before a judge since the Justice Department revealed in court documents on Friday that he is the subject of a months-long criminal investigation. FBI agents raided Cohen's home, office, safe deposit box and cellphones last week. Cohen's attorney said investigators in New York City were referred by Justice Department special counsel Robert Mueller, who is investigating the Russian attack on the 2016 election, from Washington, D.C.
Raising the stakes: Michael Avenatti, the attorney for adult film actress Stormy Daniels, told NPR on Sunday that he will be attending the hearing — and he told CNN that Daniels also will be in attendance. Cohen arranged for a payment of $130,000 to Daniels in what Avenatti said was in exchange for a nondisclosure agreement related to a sexual encounter with Trump before the 2016 election. Daniels, who has been talking openly about what she says was her liaison with Trump, is suing to get out of the agreement. People familiar with the Cohen investigation told The Washington Post that Cohen is being investigated for bank and wire fraud, but it isn't clear yet how or whether all the threads — the Russia imbroglio, Daniels or potential other matters — tie together. The next phase is a battle over the procedures involving who may review the materials seized by FBI investigators last week. In a letter filed with the court on Sunday night, the president's attorneys argue that Trump's team should be able to review documents seized in Monday's raid to protect attorney-client privilege. That is despite the Justice Department's creation of an independent team — a "clean team" or a "filter team" separate from the prosecutors and investigators looking into Cohen — to review the material. The Justice Department's practices are intended to protect a defendant's attorney-client privilege. Prosecutors depend on the "clean team" to segregate evidence and divide that which might become part of a court case from that shielded by attorney-client privilege. Although communications between lawyers and their clients generally are shielded, the privilege has exemptions, including for criminal activity and fraud. Trump's attorneys argue that he and Cohen should not have to rely on the government's "clean team" to review the documents to protect his privilege, as he has "a unique interest in ensuring that every privileged item is fully protected from improper disclosure." Cohen made a similar argument last week. Prosecutors argued that allowing the subject of a search warrant the ability to review what was seized before investigators can defeat its purpose. They say their investigation into Cohen has revealed "evidence of a lack of truthfulness" so he couldn't be trusted to voluntarily review the documents — thus the need for the warrant. Prosecutors also say that based on search warrants previously executed on Cohen's email accounts, a "filter team" independent of investigators came to the conclusion that Cohen "is, in fact, performing little to no legal work" and therefore very little of what would be seized in a raid would be protected by attorney-client privilege. In other words, although Cohen is a lawyer, most of the work that has interested investigators and prosecutors is not legal in nature and so none of the public discussions about attorney-client privilege apply here. But that doesn't mean that a federal judge might not be sympathetic to challenges to the way the FBI and Justice Department ordinarily do business in these cases. "I do think there's a chance, that because the president is involved, that the judge is going to take extraordinary measures to make sure that this process was properly implemented," Kimberly Wehle, a former assistant U.S. attorney, told NPR's Morning Edition on Monday. All the same, this legal back and forth over the potential review, she added, is "highly, highly unusual." Cohen's attorneys followed up with another request on Monday morning for federal Judge Kimba Wood to appoint an independent outside lawyer to review the evidence in the case — a "special master," as opposed to the government's "clean team." Cohen's hearing is set for 2 p.m. Monday in Manhattan. Wood requested that his lawyers present Cohen's client list before then, as she decides whether the material seized by the FBI would infringe on attorney-client privilege of any other potential clients. Cohen's attorneys wrote on Monday morning that although they would be willing to identify his clients to the "special master," some of the clients have asked not to be identified now. The U.S. Attorney's Office says the judge should reject Cohen's requests about reviewing the evidence. "Cohen's novel proposal [for review] would set a dangerous precedent," wrote the U.S. prosecutors, in Friday's filing. "It would permit subjects or targets of an investigation, who have not yet been indicted, to delay government investigations into their criminal conduct, by giving them, and not the government, the authority to make unilateral determination not only of what is privileged, but also of what is 'responsive' to the warrant."